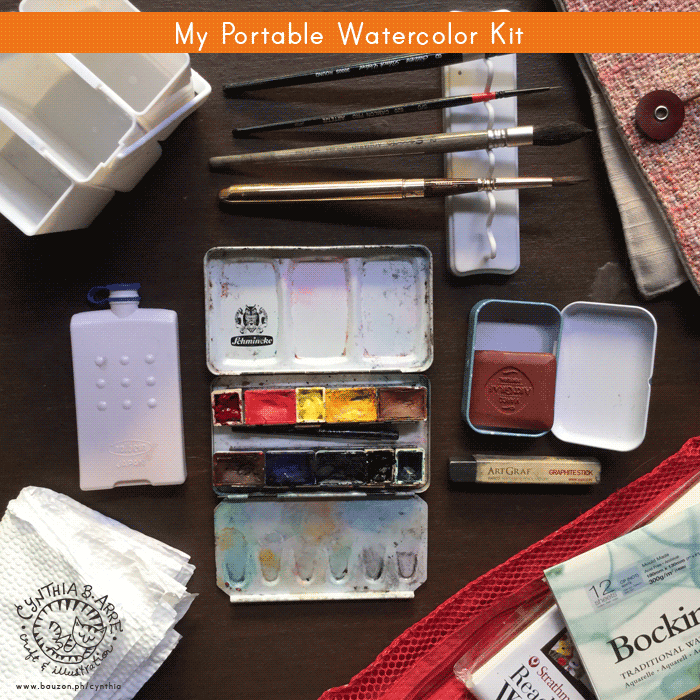 My DIY Portable Watercolor Kit | Cynthia, inside. 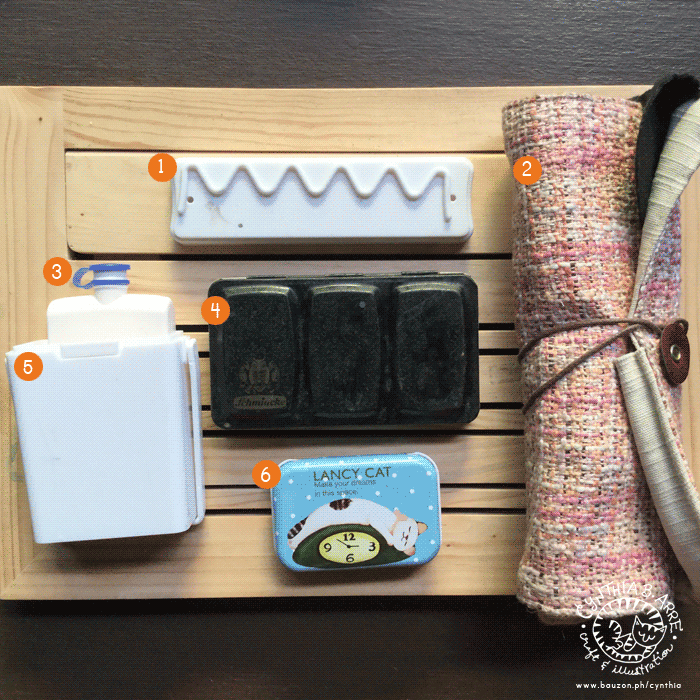 The actual kit is a red pouch that measures 11.5″ x 8.5″ that I purchased for P88 years ago in Daiso. 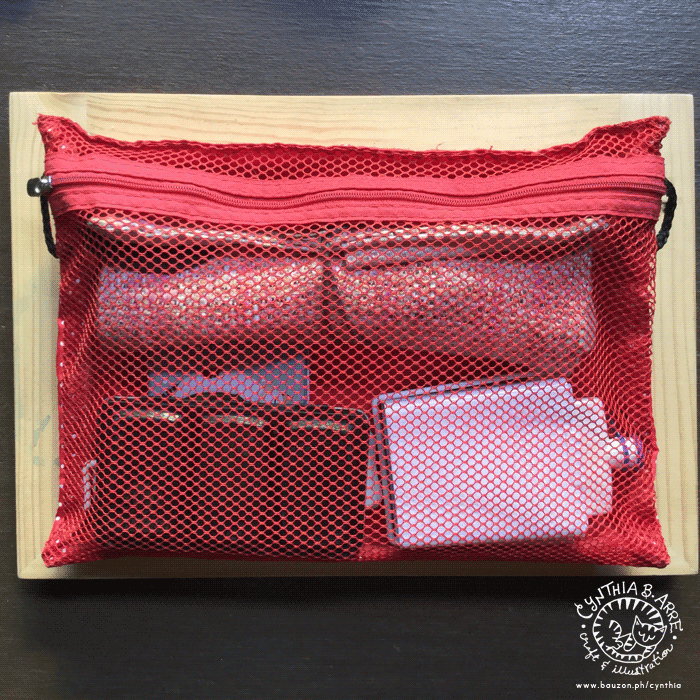 I think it’s a travel accessory pouch but I’ve found it suitable for storing my painting materials especially since the mesh front pocket allows anything that might still be wet inside it to air dry even when already packed. 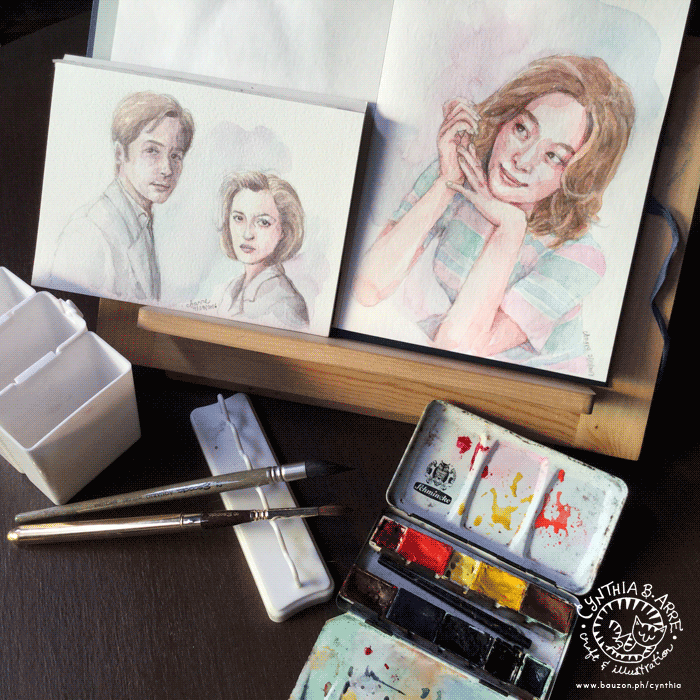 The kit is sitting on a wooden book stand (bought from Fully Booked but it’s similar to this one) that I use as an easel when doing on-the-spot portraits. I have a portable table easel too, you’ll see it in use in this video, but it’s bigger and heavier so I only use it for outdoor events or when I hold workshops. 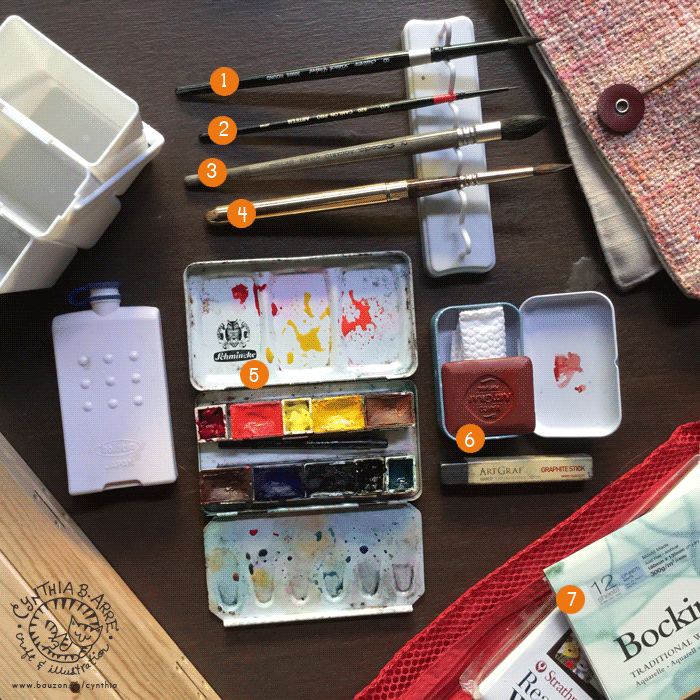 The back of the pouch has two more pockets where I store watercolor journals, pads and paper towels. See just how sulit this P88 bag is? By the way, the Clester journal is from Sekaido in Tokyo (I also use the Albireo journal which is slightly cheaper) and the Bockingford pad is from ArtWhale. Brush stnad (given by my friend Jovan (@starshuffler). I believe she bought this in an art store n Hong Kong), Never leave your brushes submerged in water, guys. You can rest them on paper towels when not in use but I particularly like how this holder lets my brushes’ bristles dry while keeping their shape. 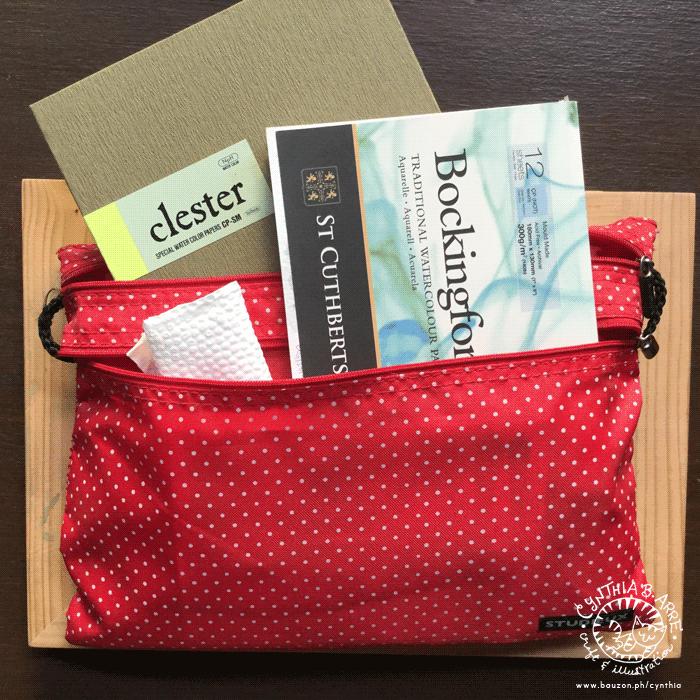 A roll-up tool case I bought from crafter friend Nikki of Tweed & Twine. I like that this tool case has wide pockets so I can keep rulers and small pocket palettes in it too. Also, fabric = breathable! Flat water bottle from my Holbein Pro Compo II travel set – a kit I stopped using because it’s quite heavy and bulky. I transferred the paint from it into a folding palette. Collapsible water pail that I bought in Sekaido (Shinjuku main branch) last year. Little tin container bought for P29 in Landmark. I have lots of these and I use them for storing extra paint pans or graphite sticks. Silver Black Velvet Brush #8, a gift from my cousin abroad, locally available from Craft Carrot. The bristles are synthetic and I like how I can make both fine lines and semi-thick washes with it. Artetje Canlon Pro 5/0 brush I bought in Sekaido. I think it’s meant for miniature work and I only use it for detail work if necessary. Escoda Aquario #12 Squirrel Mop from ArtWhale — my all-time favorite brush. It’s a great mop for laying down initial washes of transparent color and if I forget to bring my other brushes, the pointy end is awesome for sketchy detail work too. Escoda Reserva #8 Kolinsky Sable Brush, also from ArtWhale — my next favorite brush. It’s collapsible so it’s perfect for travel. It can hold a lot of paint and is great for laying down juicy strokes of color which supplements the initial base washes made by the Aquario. I have a video of the two brushes in action on my Youtube watercolor tutorial channel. Some of the paint in the original palette has dried up so I filled it with colors I actually use which is a combination of Shin Han, White Nights, and leftover Shcmincke pans. I alternate this palette with my other folding palettes (see photo below), depending on what I’ll be painting that day. Viarco ArtGraf Water-Soluble Tailor Shape Graphite Block in Sanguine and ArtGraf Graphite Stick, both from ArtWhale. These are awesome and dissolve unbelievably smooth with no obvious streaking, perfect for live figure drawing sessions. My alternate folding palettes. 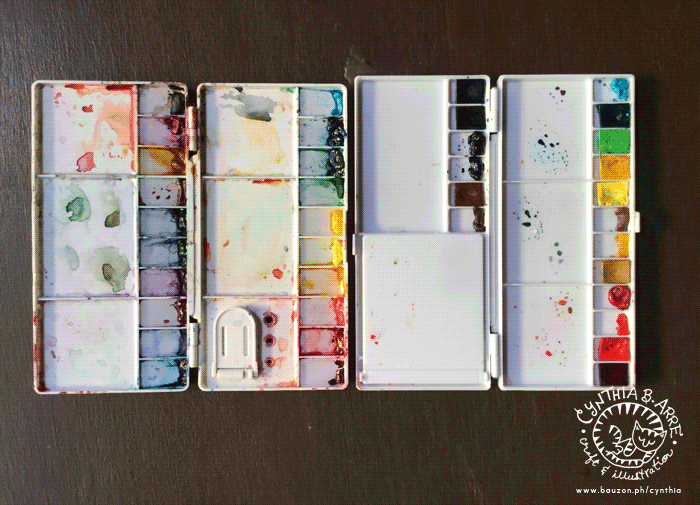 I love this kind of palette since they are light, inexpensive and they have ample space for mixing colors. The one on the left is the palette I use the most since I’m already accustomed to the paints in it. You can refer to this old post for the colors / brands it contains (though I replaced 3 or 4 of the colors since writing that post). The palette on the right contains Holbein paint from that I transferred from my Pro Compo II travel kit which, as mentioned above, is really too bulky for me to lug around. And finally below is what the portable setup looks like when in use.